Hewlett Packard HP C8715A professionally remanufactured black inkjet cartridge for most Pitney Bowes, Neopost, Rena, Secap, Astro, Asmarc, FP Mailing Solutions, Kirk-Rudy and MCS Envelope / Address inkjet printers. Super fast dry black ink. Developed for use in Addressing and Packaging where a wide array of substrates that are used without a heater or dryer. Works best on porous materials. 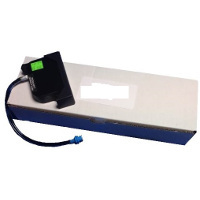 Compatible with Collins Ink TWK-1961H / Rena C8715A. Similar to the MRH95A but with a much faster dry time.